This document goes over the basics of using Camtasia to record a screencast. It also outlines specific settings that should be used for creating course content. These settings include recording dimensions and the recording file format. Try to keep the overall Screencast/Presentation as short as possible (approximately 2 – 15 minutes in length). Keep in mind the overall structure of the Screencast/Presentation when making choices about length, and where to break things up. Should something go wrong with a recording, it will be only a small part of a larger presentation and easier to re-record. This allows for faster and easier editing by the Media Team. This approach can give you another perspective on the structure of your presentations. Smaller pieces make it easier to reorganize content in a presentation, or the course, if needed. We will be delivering these screencasts to students on a wide array of different devices and screen sizes. It is very important that we do not create screencasts that are way too for student’s screens. We would like to avoid requiring a student to view these screencasts in full screen. Going to fullscreen and back can be a tedious task for some students. In service of this, we will be recording all screencasts at 1280×720 pixels (720p). This recording will most likely be scaled down a bit further when placed in our video players. 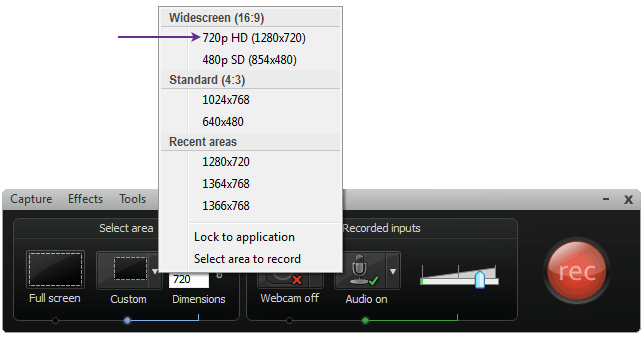 To go along with recording at 720p, you should consider the interface and text size in the programs you are using. We understand that it is not always easy or possible to increase the size of screen elements or text in all programs. That said, we ask that you increase the size of any elements or text you can when creating screencasts. This will allow for better legibility in the resulting videos. Be sure that the amount of ambient noise at the recording location is at a minimum. It is also important to do a quick test recording at the beginning of every recording session and listen to it to hear whether it sounds okay. You don’t want to do a whole recording session, only to find out later the audio quality was poor. We provide support when using Camtasia for Windows. If you would like to use other screencasting software, be sure to stick to the above-stated guidelines/requirements. If you have any other questions, please contact the Media Team member working with you. The only preference/setting we have to change in Camtasia is setting recording format to .avi. This should only have to be done once per machine. In the recording session controls window, select “Options…” from the Tools menu. In the General section of the Options window, in the section Saving set the Record to: format to .avi. Click OK to save this setting change. It is very important to get things set up properly before recording. It is always a good idea to keep these steps in mind every time you sit down to record some screencasts. Connect your microphone to your computer. Plug your laptop into the wall. This will help avoid any grounding issues that could cause hum or noise. Set your Monitor resolution to 1280×720 or a resolution close to it. This can be done in the Displays control panel of Windows. Then you can just record the whole screen and ignore the steps that follow about selecting part of it. Set a recording region that is 1280×720 by completing the steps that follow. Along with keeping the software you are recording inside of the smaller region. In the Select area section of the screen recording controls window, click the right side of the Custom button to bring up a menu. Select 720p HD (1280×720) from the menu. This should change the selected area of the screen, and place it in the upper-left corner of the screen. If not, move it there by dragging the handle in the center of the selection. It looks like a circle with arrows pointing in the cardinal directions. In the Recorded Inputs section of the screen recording controls window, click the right side of the Audio button to bring up a menu. Select your microphone from the list. It is usually labeled Microphone (Microphone name). Put on your microphone and test your recording levels, or volume. This can be done by speaking at a normal level and watching the Meter to the right of the ‘Audio on’ button. We want to make sure you are not too loud or too quiet. If the meter is bouncing into the red, you are too loud. If the meter is only showing a small amount of Green, you are too quiet. The Yellow middle part of the meter is the volume level range we are going for. If the meter is showing that you are too loud, you should drag the slider to the left some and speak again to test. If the meter is showing that you are too quiet, you should drag the slider to the right some, and speak again to test. Once you have set your Recording Area to 1280×720 (720p) and checked your microphone levels, you are ready to record. To begin recording, click the big red record button in the Screen Recording controls window. This will start a countdown, and then start the recording of your screen and microphone. Do your screencast. Remember to keep in mind that you have to keep all the activity in the bounds of the recording selection. You will see green markers indicating the bounds of the recording area during recording. 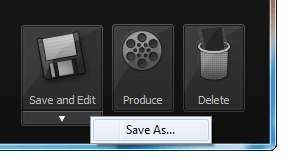 To stop recording, click the Camtasia application icon in the task-bar to return to the recoding controls window. From here, click the Stop button to stop recording. Once you stop recording, you will be presented with a preview of your recording, with some options for saving, editing, or deleting the recording. To make sure you do not to lose any recordings, be sure to save as soon as you have verified the recording looks and sounds good. To save, click the lower part of the Save and Edit button in the lower right of the window to bring up the Save as… menu. Click it. Give your recording a descriptive name, and save it to the computer. 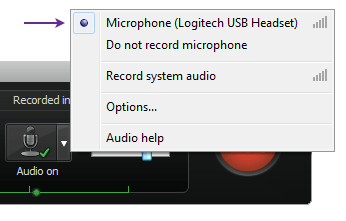 Once you save the recording, you will be back to the Screen Recording Controls window, ready to do another recording. You are now done recording a screencast. You can safely close Camtasia, or start recording a new session. The .avi files you are saving can now be sent to your Instructional Designer via the Media Uploader. More information can be found on the Media Uploader documentation page. Published on April 16, 2015 at 3:28:02 pm CDT. Last modified on June 19, 2018 at 10:31:16 am CDT.